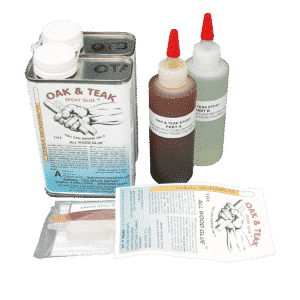 Smith’s Layup and Laminating Epoxy is the most appropriate product for gluing large areas such as laminating sheets of plywood, or in “stitch-and-glue” boat construction. It is exceptionally compatible in wood/fiberglass/epoxy composite boat construction and ideally suited for glass layup on glass/polyester hulls where blister repair requires additional glass layup. Lower-viscosity products may wet glass cloth faster, but will be less flexible than the wood and can split the wood or crack themselves with age, stress and wood expansion/contraction. Smith’s Layup and Laminating Epoxy has a flexibility comparable to wood because its formulation and ingredients are derived in large part from the natural resins of wood itself. Why Not A Cheap Epoxy? Most epoxy resin systems develop an oily film on the surface when they cure. This is called “amine blush” or “blush” or other more colourful names. The manufacturers of such products will tell you that you must sand between laminations in order to get adhesion. The chemist at Smith & Co. spent quite a few years discovering what actually causes “amine blush” (since no one out there seemed to know, which evidently is why other products do have that undesirable behaviour) and naturally discovered the reason, which led Smith & Co. to be able to incorporate in Smith’s Layup and Laminating Epoxy the technology to virtually eliminate that oily film and the need to sand between successive glass/epoxy layups. Smith’s Layup and Laminating Epoxy is not brittle. You can see this for yourself. Mix a small amount and pour it on a piece of polyethylene sheet (such as a plastic bag) and allow to cure. Just for fun, you could do the same test with whatever epoxy you have been using. In a couple of days lift the cured epoxy puddle off the plastic and bend it with your fingers. Ours will bend a bit and then crack and break. Some others will shatter like glass, with splinters flying up in the air. Wear glasses…this can be dangerous. 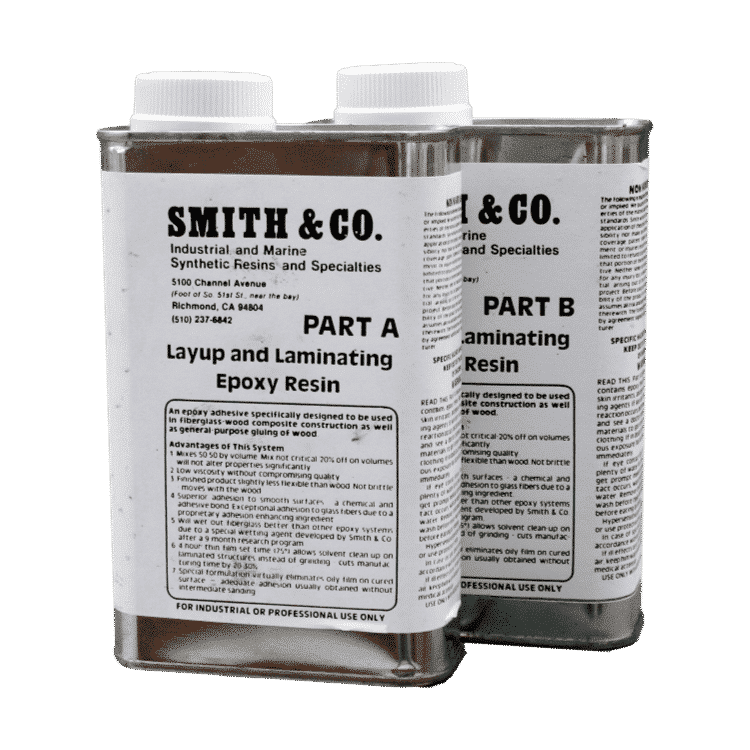 Smith’s Layup and Laminating Epoxy mixes one-to-one by volume, and is forgiving of minor mix ratio errors. Mixing by weight may be done at 10 parts A to 12 parts B by weight. For best results mix in one container, transfer to a second container and mix again. Allow to sit 10 minutes before use. Larger mixed quantities will have a shorter pot life. Location in the sun and other factors can also shorten pot life.